Happy to continue hosting this challenge for the 3rd year in a row. It was handed over to me by The Book Vixen and I’m so glad to invite to join in again if you did before, and call for newbies to sign up for 2018 Outdo Yourself Reading Challenge. I pledged to read a 100 books in 2017 and I’m happy to report I’m 35 books over that. I did mean to read more serious books, but with all the already serious stuff going on in my life for a large part the year, I needed to read books that didn’t make me think so much! In 2018, I’m aiming for 150 books and more reviews. How many books did you read in 2017? What’s your target for 2018? Come join us in challenging yourself to read more. If your goal for 2018 is to read more, then this is the reading challenge for you! Are you up for the challenge? Runs January 1, 2018– December 31, 2018 (books read prior to 1/1/2018 do not count towards the challenge). You can join anytime from now. Sign up in the linky at the bottom of this post. The goal is to outdo yourself by reading more in 2018 than you did in 2017. See the different levels below and pick the one that works best for you. You can move up a level as often as you’d like but no moving down. Remember, the idea is to challenge yourself. 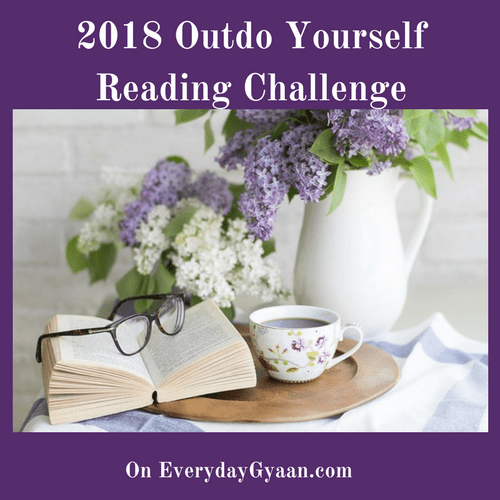 To join the challenge, grab the 2018 Outdo Yourself Reading Challenge button below and post this reading challenge on your blog to track your progress. Please include a link back to this sign-up post so others can join the reading challenge too. You do not have to be a blogger to participate; you can track your progress on Goodreads, LibraryThing, BookLikes, etc., so as long as you have a dedicated shelf for the 2018 Outdo Yourself Reading Challenge and your profile is not private. The point of linking up is to have a place where people can see what you’re reading. Please include your name & the name of your blog (e.g. Corinne @ EverydayGyaan.com) with the direct URL link to your blog post or dedicated shelf (on Goodreads/LibraryThing/BookLikes). Any links to a blog’s home page or main profile will be deleted. I have accepted the challenge and created a mini-post. For now, I will go with the Getting my heart rate up challenge- that is for what is left of January 2018. I would like to join the challenge. I commit to reading 200 books this year. Wow Corinne, reading 135 books is just amazing. That’s genuine love for reading. I am excited to take up this challenge. I haven’t taken up any reading challenges before but few years back I did read 50 books in a year but at that time I had no additional responsibilities. But your post is encouraging me to just do it. Let me start with 6-10 books , but I will build my pace during the challenge. I am doing this! Thanks for this challenge. Wow! I love to read but can’t imagine. I’m doing good to get all my Bible study books and Read Thru the Bible done with a couple of novels. You go! Glad you hosted this again. I set my goal for 2017 at 68 books….I read 79 books. I’ll be joining you again in 2018. Have an awesome New Year! Hi Corinne let’s do this .Willing to take you up on this with 150 books .Since you included ebooks and audio books. The dedicated post /page will be up tomorrow. Most of the books I read are e-books, Amrita. Yay. I was waiting for this post so that I could compile the reading challenges I want to participate in 2018.150 books? Wooooooow!!!! Looking forward to your number, Shalz!